The infamous Tunguska crater is not the only site in Siberia where tremendous high-energy events have taken place. Many Picture of the Day articles have addressed the so-called "impact craters" that pepper our planet like the wounds from a hot poker. 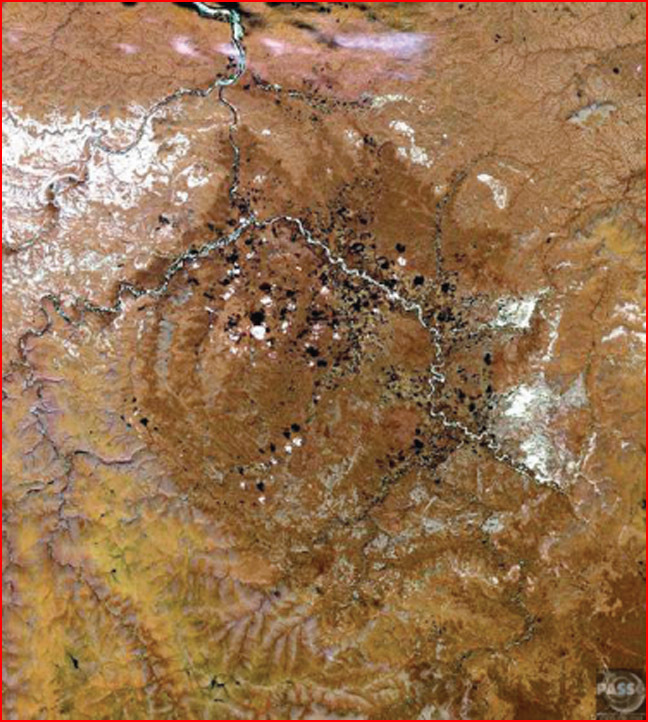 Bizarre landforms and anomalous blast features have implied that other factors could influence their formation. Libya's Kebira Crater, Canada's Manicouagan Impact Structure and the Wilkes Land Crater in Antarctica point to forces beyond the strictly mechanical (heat, shock and gravity), providing a backdrop for theories of electric blast effects. In the Russian wilderness, 120 kilometers from the Arctic Ocean, is a crater that rivals the largest ever discovered. Popigai is over 100 kilometers in diameter and provides evidence that it could have been excavated in an instant by a plasma discharge of planetary proportions. Popigai and Manicouagan are both considered to be the fourth largest craters on Earth. Only Vredefort (300 kilometers), Sudbury (250 kilometers) and Chicxulub (180 kilometers) are larger. Popigai's topography and geological unconformities are striking. The bedrock within the site was forced downward and outward, shattering into megaton blocks that were subsequently thrust away and piled up along the crater rim. Some of the largest fragments were thrown over 70 kilometers from the crater. The rim material was then sliced away exposing a cross section of the contorted strata with embedded giant stone blocks. Gneiss deposits were fused into a glass-like compound that covers the floor of the crater and appears to have splashed up and over the crater rim. The molten glass inundated several hundred square kilometers of the surrounding terrain with a thick layer capping the chaotic breccias. Meltrock over 600 meters deep has been found mixed with suevite, a type of stone thought to be produced when large bolides strike the Earth. Suevite is found in many other locations around the world and supposedly indicates a thermal stress great enough to compact and fuse the soil and rock into a conglomerate containing "shocked" crystals. The micro-fractures are the result of overpressure through the crystalline matrix. Samples taken from the Popigai crater all contain shocked grains and tiny craters, evincing the extreme conditions that resulted in their formation. One of the more interesting features of Popigai is that diamonds are found in and around the crater environs. The pressure waves released by whatever phenomenon caused the crater are thought to have compressed the graphite within the gneiss formations and instantaneously transformed it into diamond. The blast that created the precious gems also threw them over 150 kilometers to the east, where they can be found loose in the soils and the rivers. Their value is great enough that it is very difficult to explore the region because the Russian government has built diamond mines and processing centers nearby. Diamonds are primarily found in deep chimneys called "Kimberlite pipes" that reach down into the Earth for several kilometers. They received that name from the Kimberly region of South Africa, where diamond mining was first instituted on a large scale. Kimberlite can be found in Canada and India, as well. In fact, the Hope Diamond, probably the most famous gemstone ever discovered, was from an Indian Kimberlite pipe. Popigai's vicinity is rich with diamond-bearing Kimberlite. The most mysterious aspect to diamond formation is the speed necessary for them to crystallize before they assume their layered phase and become simple graphite. Conventional theories suggest that diamonds begin their journey over 250 kilometers below the surface in the incredible heat of subterranean pressure cookers. Recent analysis shows that the diamonds must travel from the upper mantle at over 180-kilometers-per-hour in order to achieve crystallization. Kimberlite pipes are theorized to be the offspring of hypervelocity bolide impacts, and they are, indeed, associated with craters and other non-uniform geological structures. As we have pointed-out in the past, however, it is not large rocks from space that generate these anomalies, it is lightning bolts with trillion-joule heat that most likely shaped the topography we see. Glass spherules from the Popigai event have been found everywhere on Earth, especially on the bottom of the Indian Ocean. Small glassified spheres are one hallmark of plasma discharges and have been compared with those discovered on Mars. Just like their distribution on Earth, the "blueberries" on Mars cover thousands of square kilometers and exist in the trillions. Along with the diamonds, near-vertical crater walls, the flat floor, the mega-breccias, the giant stones sliced in half as if by a laser and the glassified overburden, there is the problem of age. Despite being dated at over 250-million years, Popigai retains a freshly cut appearance. 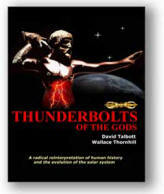 Perhaps a better proposal is that a titanic "thunderbolt of the gods" produced both the diamond-bearing Kimberlite and the morphology of large craters.